The former workers, who staged a 161 day sit-in at the Vita Cortex plant, are to meet the President at Áras an Uachtaráin today. 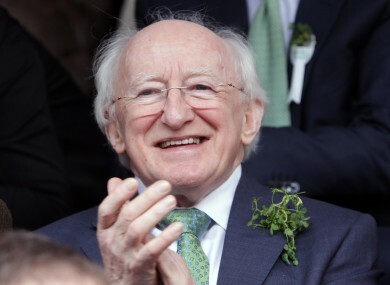 PRESIDENT MICHAEL D Higgins is to meet with former Vita Cortex workers today at Áras an Uachtaráin. President Higgins invited the workers to the Áras following the successful resolution of their long dispute with the owners of the Vita Cortex foam manufacturing plant over outstanding redundancy payments. The workers, all SIPTU members, occupied the plant at Kinsale Road in Cork for 161 days before the sit-in ended on 24 May 2012. A resolution to the dispute had been reached on day 139 of the sit-in – after workers had already spent more than four months at the plant – however they refused to leave until the payments had cleared in the bank accounts of all of the former employees. The workers received messages from a number of high-profile supporters during the sit-in, including Mary Robinson, Noam Chomsky and Alex Ferguson. There was also a high-profile campaign across Facebook and Twitter which saw thousands of people supporting the protest. The former workers and their families along with SIPTU Vice President, Patricia King and General Secretary, Joe O’Flynn, will meet President Higgins at 2.30 pm. Email “President to meet with former Vita Cortex workers ”. Feedback on “President to meet with former Vita Cortex workers ”.